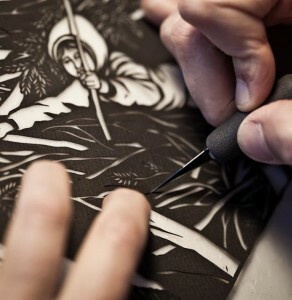 Olympia artist Nikki McClure creates intricate papercut designs using only black paper and an X-ACTO blade. Photo by Lisa Owen. Celebrated artist Nikki McClure keeps her roots in Olympia. Photo by Lisa Owen. When celebrated Olympia artist Nikki McClure recently appeared at the Lacey Timberland Library for an event titled Meet Nikki McClure, audience members left feeling as if they’d just been given a deeper view into the private world McClure creates for her ever-growing fan base. In between reading from a handful of her books and answering questions, McClure demonstrated the intricate paper-cutting process she’s become well known for. Seemingly effortlessly – and using only black paper and an X-acto knife – McClure recreated the cover of her latest book – which was also her first, self-published in 1996. “It’s a merging of those two,” McClure explains, in an interview given a few days before her library appearance. The book, Apple, contains the very first paper-cut she ever made. “It was a book I made for Arts Walk,” she says. “I just ran off to Kinko’s and made the closest thing I could make to a book.” McClure hand-colored the apples with red crayon and tied it with a red ribbon. Now a well-established illustrator and author – a New York Times bestseller who recently won the 2012 Washington State Scandiuzzi Children’s Book Award – McClure felt it was a chance to make Apple into the book it always wanted to be, with a much wider audience. She changed one of the pictures and added minimal text – just one word for each page. “It’s taking the old, but then updating it,” says McClure. A McClure career retrospective – Nikki McClure: Cutting Her Own Path, 1996 – 2012 – is set to run at the Bellevue Arts Museum from November 13th through February 3rd. “It’s really a nice time in my career and stop and think, well, what have I been doing?” McClure says with a laugh. “Because it’s been such a whirlwind,” She says she can now pause and wonder where her work will go in the next 15, 20 years. 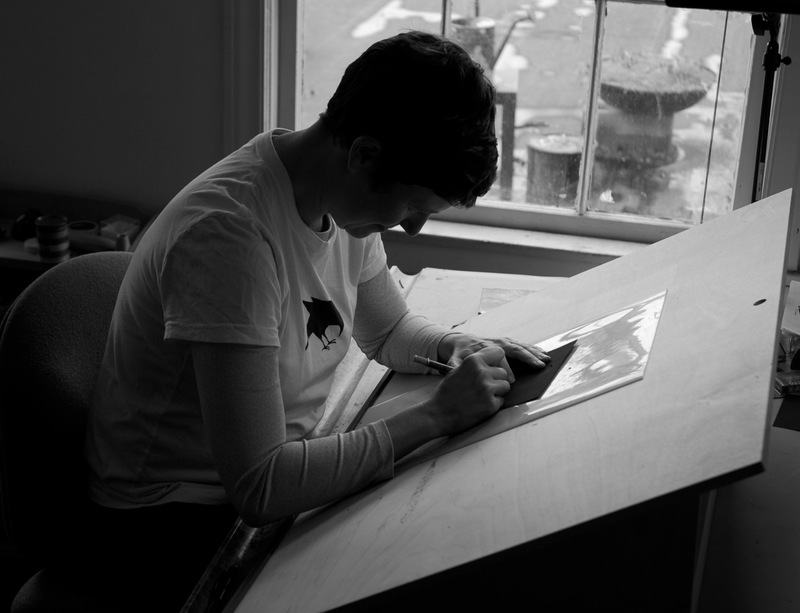 McClure is an illustrator who grew into an author, as well; her earliest books had little or no text. Recent books, such as To Market, To Market and Mama Is It Summer Yet?, remain full to the brim with McClure’s quietly beautiful paper-cuts, but the addition of pitch-perfect language makes them somehow even fuller. McClure finds the writing side more challenging, but also enjoyable – given enough time to complete. She says it feels like time is always too short at this point in her career to write more. McClure has been producing and selling her own merchandise for many years: posters, note cards, t-shirts, and more. She began creating her now extremely popular calendars in 1998. Even working for herself and striving to set the pace at a comfortable level, McClure still feels busy at times. She and her partner, husband Jay T. Scott, a woodworker, balance and support one another. “When my son was really little, I’d work in the morning when my mind and the light was better, and then he would work in the afternoon,” says McClure. Promotional book tours are a family affair. “I take them with me, so my son has been able to go and hang out in New York City and Boston and Cape Cod and California. He has a great time,” she says. Though McClure’s work is clearly autobiographical, she dubs it “fictionalized fact.” “There are some element of make-believe within it,” she admits. 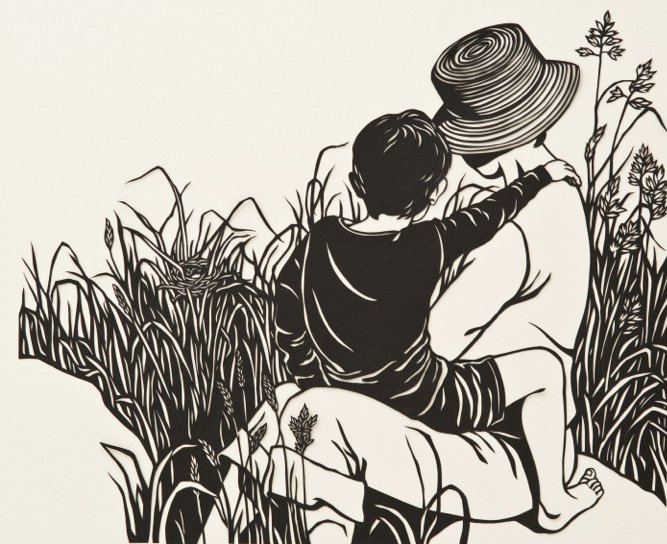 The growth of her son, Finn, has been documented in her paper-cuts, from toddling at the Sound’s edge to riding his bicycle through a field of dandelions. But even more central to her work is, well, herself. “It’s this continuing the story of my evolution of me – a woman who is experiencing these things in the world. That’s the main story. The kid element is just the cute factor,” she says with a laugh. The body of work McClure has crafted over the years, from such a personal place, has also become intensely personal to people McClure will never meet. “I think that’s pretty amazing and I feel very lucky,” she says when asked about the scope of her audience and their reactions to her work. “It’s nice that the art that I make brings positive energy into so many people’s lives,” she says. Living the life of a self-sustained artist is made easier by the home she’s chosen. McClure’s abiding love for Olympia and the deep roots she’s grown here over the years are central to her life and her art. Does she ever imagine living somewhere else? McClure will speak at the Evergreen State College Art Lecture Series on October 17th from 11:30 a.m. to 1:00 p.m. The event is free and open to the public. A McClure career retrospective – Nikki McClure: Cutting Her Own Path, 1996 – 2012 – will run at the Bellevue Arts Museum from November 13th through February 3rd.